Medium Green Tone SuperLEAF! Medium green tone leaf excellent for black oaks and most eastern hardwood trees. Available in a handy 16oz. 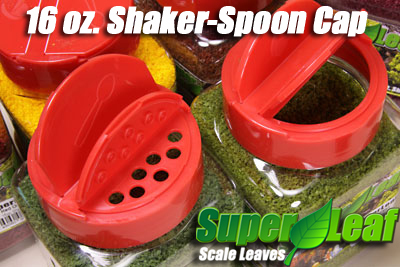 (by volume) jar sealed with a plastic cap which provides two options for either spooning the leaves or shaking. Approximately 2 cups of leaves. (Scenic Express' NEW SuperLEAF Medium Green color similar to Noch Dark Green Leaf Flake Flock NH07146/NH07152).